Fully renovated and furnished with cabinets and extended kitchen(wet and dry). Currently tenanted. 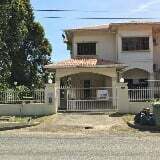 Taman Mawar Sungai Wang (Rose Garden) Kinarut Double Storey CORNER, renovated, good condition, exten. Nicely renovated and located at very strategic location, within vicinity of 1Borneo Shopping Mall, U.
Tiles flooring to upper floor. Covered car porch and fully-tiled. Renovated with music roo.